A couple of weeks before I went to New Orleans for the purpose of visiting the Slave Museum (aka Whitney Plantation) I mentioned the new museum to a New York poet whose work I admire and have published for many years in my Syndic Literary Journal. He responded with a suggestion: at the foot of Canal Street, there is a ferry that will take you across the Mississippi to the docks of Algiers where the slaves were housed when they first arrived in New Orleans to be auctioned off in the French Quarter. Stand on the docks of Algiers and look back across the river to see what the slaves saw before they were ferried over to the auction. Of course, you have to ignore the modernity of the city’s skyline, but even so, you will capture the view that was available to the slaves. 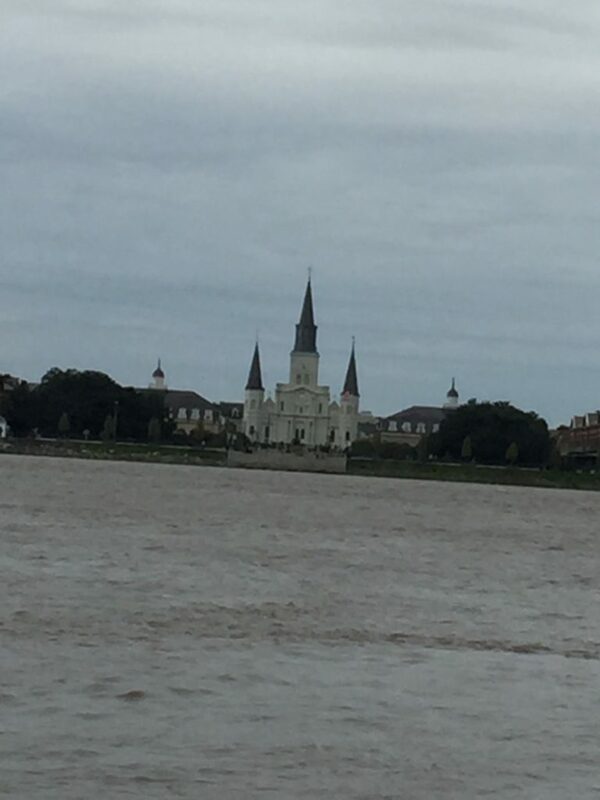 I looked back from the docks of Algiers and saw the 1850 (rebuilt) Cathedral of St. Louis. I realized the poet’s insight: I was looking at a religious world icon built with profits derived from a 1452 papal bull that authorized slavery in the New World.